If your lifestyle includes being out of town a lot or you want to pick out your own choices....the Buy Online may be your best way to get our products. Buy directly from All Seasons and choose your pickup at checkout. We put our turkey in a water and apple juice and salt brine over night before Thanksgiving. 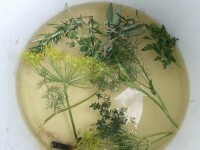 2 parts water to 1 part apple juice and about 4 tablespoons of sea salt to that mix plus our fall brining herbs. Herbs are full of flavor now after hot dry days of Indian summer. Also a great idea to do with our full sized roasting chickens also for sale for farm pickup. Love the taste of celery, but not the stalks? Cutting celery has the flavor of celery, but without the bitterness or need to use up stalks. Great in soups, brines, salads, or as flavorings on meats. Our hens are raised outside on pasture. They eat bugs, grass, lots of greens and veggies, and feed that contains no hormones or antibiotics or other artificial ingredients. Into the chicken coup at dark and out at sun rise. Deep orange yolks and whites with substance! 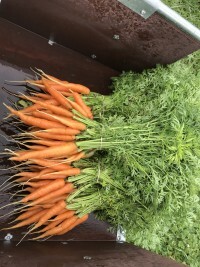 Our farm is licensed and inspected by the Department of Agriculture, State of Illinois. Great alternative holiday or special occasion gift.......fresh organic fruit and veggies. The recipient can call the farm and place order over the phone or come to the farm or to the winter farmers market in Carbondale to use it at our stand there. The gift card is heavy card paper with a nice design, our contact information, and an envelope. We have no expiration date and the gift can be fulfilled with multiple $10 min. orders. 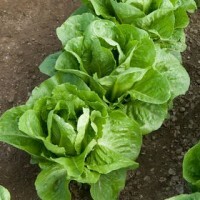 Mildly sweet yet crisp, this lettuce is a great keeper. 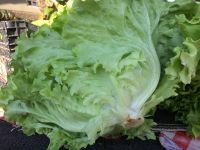 Large leafs for sandwiches or wraps, crisp interior for crunchy salads. Great all summer long! A smaller green romaine with a nice crunch. Smaller size often means nice small leaves that need little cutting. Greens mix is one of the healthiest choices you can make for fall winter healthy eating. The mix contains baby kale, tatsoi, mizuna, mustard, arugula, beet greens, and other baby greens. Its best with a sweet light dressing of olive oil, honey, rice vinegar, and a splash of lemon. 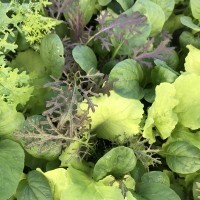 Eight varieties of red and green baby lettuces ranging from butterhead to curly endive are included in this pretty mix. Mild yet crisp combination washed and ready to eat. 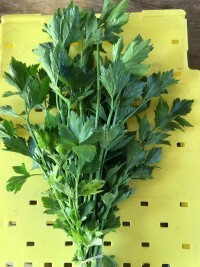 Flat leaf parsley when grown organically has a flavor and smell that enhances any soup, salad, pasta or herbal rub for meats. We often boil up some noodles, add parsley and mozzarella and a little parmesan and whala! you have a nutritional meal in minutes. 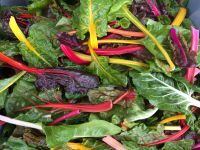 Classic for its beautiful arey of bright colors, our Rainbow Chard is a taste that adds depth to soups, especially those with beans or lentils, or is great on its own......braised in a little olive oil with garlic and onion. Some folks love it over polenta or mashed potatoes. Check out recipes for lentil chard soups......one of my favorites as far as taste, and lentils cook up in 10 or 15 min versus the long simmer time for beans! 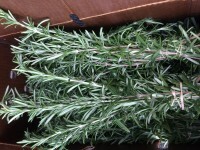 We have a 25 ft long row of rosemary in one of our high tunnels and it makes an aroma while working in there divine! Rosemary is great with potatoes or soup, and through a stalk into some ice tea or hot tea and you have yourself a rich libation. Fresh local Certified Organic Spinach is a real treat. 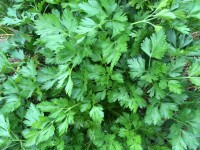 Out of the field it is an emerald green, dense in nutrition, and wonderful as a salad, braised, or in soups. 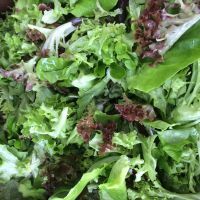 All Seasons Farm specializes in spinach and other nutritious greens and lettuces. 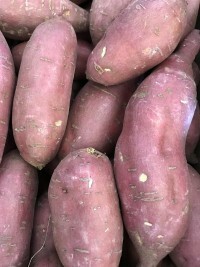 Bayou Belles are a deep red sweet potato with exceptional taste. Generally a bit smaller than traditional deep orange sweet potatoes. These 10 week old roasters are tasty and tender. No hormones no antibiotics or any kind of chemicals used. Natural feed and veggies from the garden was their diet. Great for roasting in a dutch oven or for getting that chicken broth ready for the holidays or winter soups. Lots of white meat.....for roasting start at 450 for 15 min then go to 350 for about 2 hours.......for broth and soups we cook on a low low boil for about 6 hours then freeze some of the meat for tacos or chicken enchiladas or soup later in the winter. The broth we dont use for soup we put in five or six containers for soups or casseroles to come! About 9 lb tender young chicken!